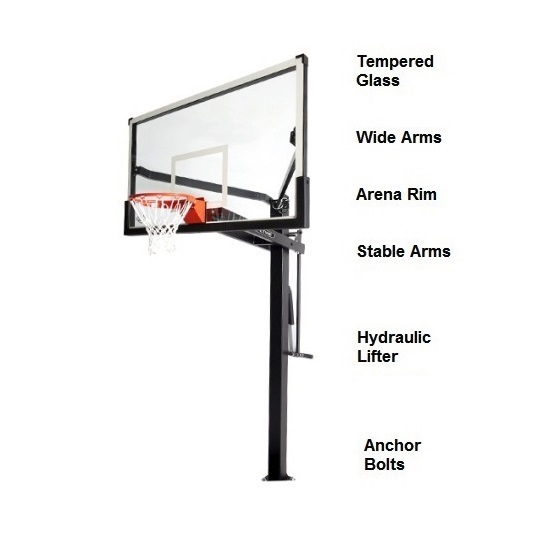 All new Mammoth basketball system model 90181 tops of the line of heavy-duty basketball hoops in the Mammoth line from Lifetime Products. Replaced 98872 and 98874, This large basketball goal features a 72 inch tempered glass backboard and a sturdy 6x6 inch square pole. A major feature upgrade between this model on the now discontinued 98874 Mammoth basketball goal is the arena view mounting arms for the backboard. On the older model, the mounting arms attached closer to the middle of the backboard. The new 90181 has the arms attached to the outside edges of the backboard frame, providing a distraction free shot while playing. This sort of attachment also tends to dampen the movement of the backboard from side to side when the goal is in use. 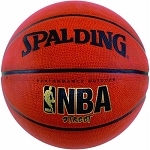 Order your Mammoth basketball hoops here. 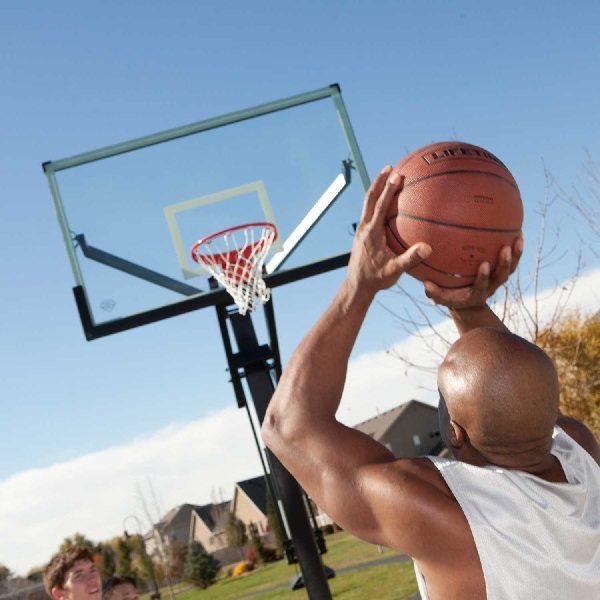 This Mammoth basketball hoop comes with a limited lifetime warranty through Lifetime Products. Backboard dimensions: 72 inches W x 42 inches H.
Backboard area is a regulation-sized backboard. Backboard material thickness: 10 mm. Comes with the Spring Flex breakaway rim. Includes 160 gram all-weather net. 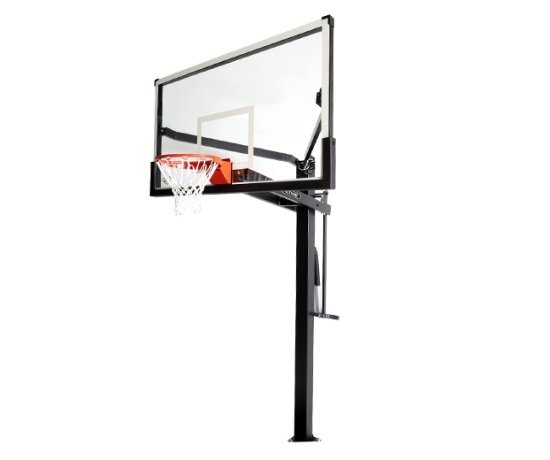 Backboard to pole clearance is a massive 48 inches, providing ample room under the backboard for play. Backboard frame thickness: 2 inches. Pole dimensions: 6 inches x 6 inches. Pole is a bolt-down pole. Pole is a 1-piece pole. Backboard height is adjustable use all new Mammoth Pump pneumatic device. 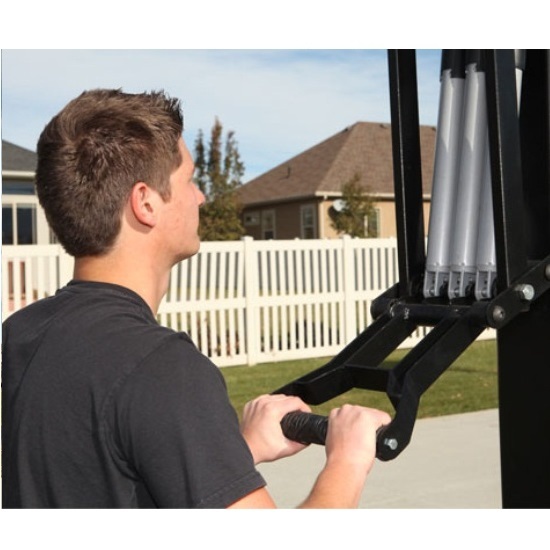 Mammoth Pump allows for easy, one-handed height adjustment. 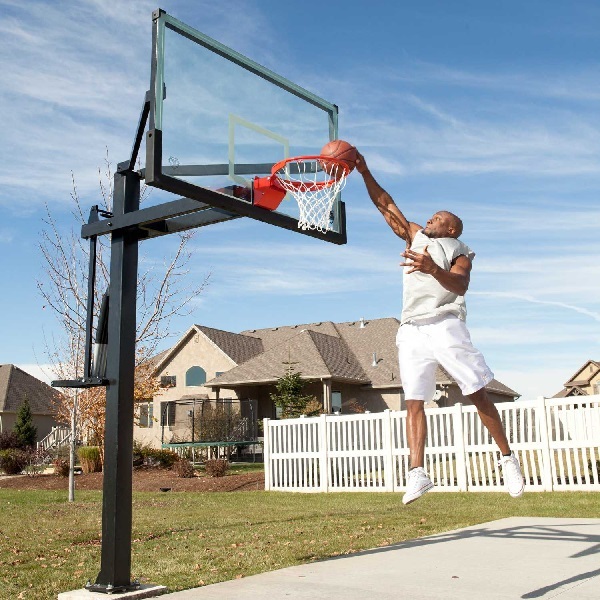 When adjusting the backboard up and down, the rim height ranges from 7.5 feet to 10 feet. Padlock included to help prevent height tampering when you want it set in position. Comes with a limited lifetime warranty from Lifetime Products. All steel components are powder coated to help resist rusting. This mammoth hoop is very very beefy. It is unreal huge. Make sure you get permission from your wife, because it will start to make your house look smaller. Installation took about 3 1/2 hours. It wasnt difficult though. The most difficult part was probably getting neighbors together to help place it once it was assembled. Q: Hello I need help on how to retract the gas shocks back in ? A: They cannot be retracted in or out without being attached to the backboard. Q: Does this include the installation kit and do you sell the lighting system that bolts to this? A: This does include the anchor kit 0090. The lighting kit is no longer available. Q: How does the new Mammoth basketball system compare to the older Mammoth basketball system? A: The newer Mammoth basketball system features a new, longer mounting bracket design. 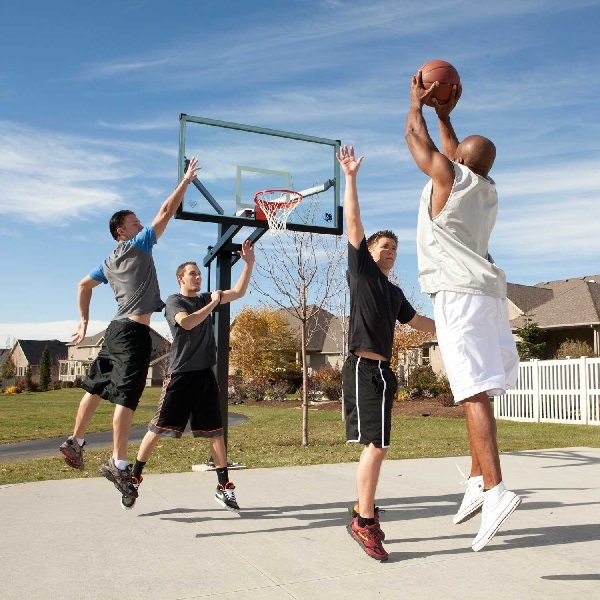 For comparably sized Mammoth basketball backboards, the newer system will typically have a bracket 3-6 inches longer, which provides more clearance between the pole and backboard. The new mounting bracket also attaches to the outer part of the backboard frame, providing a clear view behind the backboard. The old Mammoth system has a bracket that attaches towards the middle of the bracket. Lastly, the new Mammoth basketball system comes with an upgraded, pneumatic height adjuster designed to lengthen out the life of the mechanism. Regarding Shipping. Orders for this basketball hoop generally leave the warehouse within 2 business days. This product ships via an ltl freight carrier for a curbside delivery. This type of delivery requires the customer to be present to sign for the delivery and to move the product wherever needed on the delivery property. The driver does not assist moving the product on the delivery property. Delivery appointments are scheduled through the freight company before delivery is attempted. The customer can either wait for the freight company to call them, or the customer can also contact the freight company once they receive the tracking number email from us. To help you prepare for the delivery, we have outlined the overall shipping weight and dimensions below. This product ships in three boxes. Overall shipping weight: 545 lbs. Overall shipping dimensions: 123 inches x 45 inches x 12 inches. Dimensions: 72" x 38" x 30"